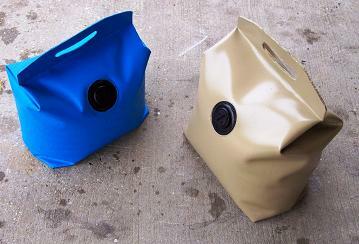 Small Portable Water Bags are the perfect way to quickly transport water around your facility. Designed to provide both a robust storage bag and an easy transportation unit, these bags have been effectively used during camping, first response, emergency water storage, and remote location potable water storage. Water Storage Bags feature two distinct design options, each varying in terms of way they are carried from site to site. Option 1 (shown above): The first bag option features a flexible bag with top handle for easy mobility to and from a location. This allows bags to be easily carried to faucets, hoses or intended storage areas. Option 2: The second option uses a series of grommets along the top of the bag. A poly rope can be strung through these grommets to create a custome length handle, or to daisy-chain bags together. Each bag can then be placed over the shoulder for easy transportation. Both bag options come with a minimum order requirement of 10 bags. Pillow and bladders tanks with capacities of 10, 20, 50, or 100 gallons can also be provided. These small water containers have been used in a wide range of locations for various applications including emergency relief efforts, military operations, and humanitarian relief. This small yet reliable bag has allowed customers to quickly transport drinking water to needed locations around their site or job area. It has also provided an easy way to bring water to new locations during emergency relief efforts. They've even been used as a practical alternative to sand bags.